200 acre site purchased by the Admiralty in March 1940. 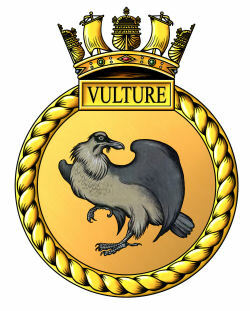 31.12.1953 when VULTURE paid off. Emergency landing ground for aircraft using ranges. Satellite to R.N.A.S. St. Merryn. The landing ground lies on the coast 2½ miles S. of Tintagel Head, 1½ miles WNW. of the village of Delabole, and adjacent NW. of the village of Treligga. Launceston lies 15 miles E. and Bodmin 10 miles SSE. R.N.A.S., St. Merryn, lies 11 miles SW. The River Camel flowing into Padstow Bay, 7 miles WSW. Tintagel Head. A small ravine runs from the N. side of the landing ground to the coast between Start and Dennis points close northward. A secondary road running SSE. from the landing ground connects with the main Bodmin-Launceston road. Access to Delabole station, 2¾ miles (R), on the Southern Region to Launceston. No permanent facilities. There is a control hut on the N. side. Grass surfaced with three usable strips. Q.D.M. 045°-225° . . 700 X 100 yds. Q.D.M. 165°-345° .. 800 x 100 yds. Land rises to 660' above landing ground within 2j miles NE. The land rises 200' within 500 yds. E.
The approaches from N., S. and seaward are clear. Recommended sector, mean QDM . A living hut on the E. side of the landing ground; otherwise there are no permanent facilities. Accommodation for 20 W.R.N.S. personnel at Port Isaac. Phone R.N.A.S., St. Merryn, for meteorological information. Ground targets are situated near the cliffs on the N. side of the landing area. Range with marking facilities open all year round. No squadron s operated from this station, landing area intended for 'Wheels-up' emergency landing use only.